An amazing place for a family or couple to stay - you’ll have all the space and privacy you need. 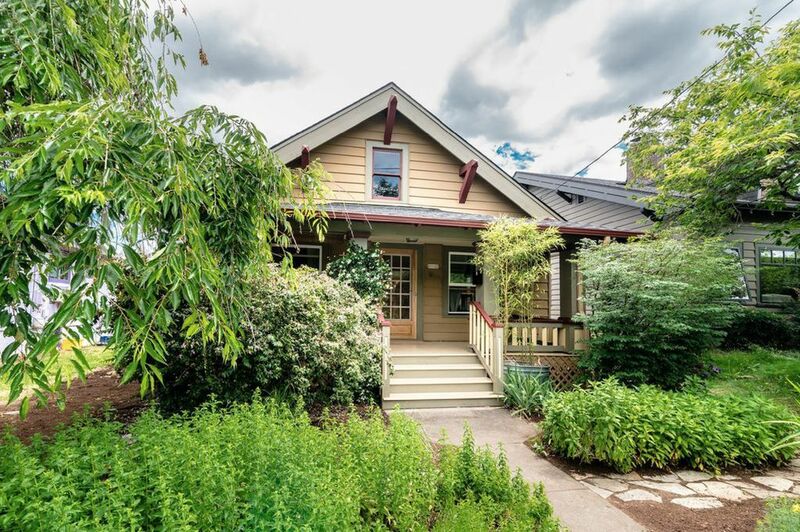 This 1912 built quintessential Alberta Arts Craftsman Bungalow, is just one block from all the action! Enjoy the charm and character of an older home that has been lovingly updated. Just one block off of Alberta Street, walking distance from great food spots such as Bernie's Bistro, Branch Whiskey B, Stella Taco, Natural Selection, Vita Cafe, Dar Salam and Chaba Thai. The home is over 100 yrs old and has stylish updates to the kitchen with granite tile countertops, new cupboards and stainless steel appliances. A large front porch has been rebuilt with new footings, steps and handrails that gives it both stability and style. The bathroom, too, has been updated with a refurbished clawfoot tub, unique glass tile flooring and modern lighting. The backyard has a large, decorative patio as well as a decomposed granite space that is perfect for lounging and hanging out. At the Bungalow Alberta, the craftsman exterior is matched by sleek, contemporary guest rooms and stocked with modern amenities. You’ll find comfort and convenience the moment you arrive in Portland’s Alberta Arts District. Whether you’re in town for business or leisure, Bungalow Alberta offers a pristine location to recharge while experiencing Oregon. Sophisticated Space in the Heart of Portland’s Alberta Arts District, Bungalow Alberta is a perfect place to relax after a day exploring the city. A 50inch Smart TV + Soundbar is the focal point of the room, the Apple TV, and queen size pullout sofa for overflow quests completes the feel. Perfect for hosting, enjoy full use of our state of the art kitchen and dining areas. Updated with modern appliances, and table settings for up to 10 people you never have to leave the house. Our expansive backyard yard living space provides a mix of beautiful flora, shady nooks, a garden with bounty complementary for guests, is complete with a cozy table and chairs for outside entertaining. As well as a fire pit for perfect ambiance. Bathroom has a clawfoot tub with shower and curtain. A robust Portable unit (looks like R2D2) installed for the season. Cools the bungalow down nicely! Ample amount of towels and washcloths. Perfect for hosting, enjoy full use of our state of the art kitchen and dining areas. Updated with modern appliances, and table settings for up to 8 people, you never have to leave the house. The dinning table expands for those extra guest. Instructions from the owner were very clear, so no problem getting there or getting in. Grocery store a couple of blocks away, and lots of restaurants along Alberta also only a couple of blocks away. The bungalow was very clean and comfortable. Lots of dishes and pots and pans for cooking meals, and plenty of room to have our son and daughter-in-law over for brunch. Even though it is located in a busy part of town, just being a block away from the busy streets made for a very quiet location. There also seemed to be plenty of on-street parking so no problem wondering if we'd find a parking spot when we got back from day trips. All in all, we will definitely stay again if our travels bring us to Portland. Charm, comfort and convenience!! This place has it all! I'll begin with this, we will be back! We have been staying in VRBO properties for 10 years and this home and owner are the absolute best we've experienced. Every comfort has been thought of and provided. The house is extremely clean, beautifully decorated and the kitchen is perfectly situated for holiday cooking as we did in abundance! If you have pets, the yard is completely secure for their safety. And the mud room is the cherry on top!! We walked our two dogs every day on the quiet streets and even to the nearby grocery stores. Our son lives in Portland and was hesitant at first to spend Christmas in a "strange home". The very moment he walked through the front door, he smiled and said "this place is awesome". When it was time to leave, he told us it was one of the best Christmas' he's ever had. Thank you Trese for making our holiday a memorable one! There aren't enough words to describe how perfect this place is. The house is so warm and accommodating with every possible amenity you could ask for! There were even accommodations for our dog with a dog bed, bowls and toys. The kitchen was fully stocked with more conveniences for cooking than my kitchen at home has. Being a short-term rental owner myself, I was more than impressed with this great house and realized I need to step it up in my place. It is in a perfect location with shops, restaurants and public transit with-in walking distance. It is close to downtown, yet tucked away in a cute neighborhood in the city. The backyard was beautiful with a fire pit and 2 grills. Trese was a fantastic host, quick to respond and willing to help any way she could. I could not recommend this place enough to people who are going to visit Portland. Thank you for a wonderful stay! The only reason that I gave this house five stars was because I couldn’t give it 10. I am a long-term VRBO and Air BNB user and I have never stayed in a better place. Located in a wonderful residential neighborhood of great walking accessible restaurants and shops, the house was so well equipped. From dog bowls and baby cribs and high chairs, Trese, the owner anticipated every request or need that visitors could have. The house was beautifully decorated and the beds were incredibly comfortable. After four days the joke became, if we need something, just look around til we figure out where Trese keeps it. Our every question was answered on laminated cards. Books, games, Netflix, internet, Apple TV, a fire ring out back with a table seating 6, this place had it all. And I didn’t mention fresh flowers, welcoming gourmet chocolate bars, USB docks in the bedrooms and laundry facilities in the basement. We traveled to Portland to host a Thanksgiving dinner and I schlepped so much equipment that never needed to be unpacked. My son flew in dragging baby stuff that was also unnecessary. Finally, one example, the listing stated that a coffee maker was available. I wasn’t sure if it would be a Keurig or French press or a traditional coffee maker. I brought my grinder and my coffee and was shocked to find that all three had been provided. We will be traveling to Portland again and I will be sure to schedule our visits around this house’s availability. The bungalow house was the perfect location for our weekend get away. Located in a quiet neighborhood, it was just a few minutes walk away from some great restaurants and a short drive to downtown Portland. The backyard has a great hangout spot with a fire pit, a grill and lounging chairs to relax in. The inside was spotless and the furnishing were comfortable. We definitely recommend this as a great place to stay while visiting Portland. This amazing bungalow is beautifully decorated and equipped, the beds are wonderful, and the owner has provided little touches not found elsewhere. It's convenient to shopping, dining, parks, nestled in a great little neighborhood. The back yard area is a delight, and fenced for doggies. Highly, highly recommended.